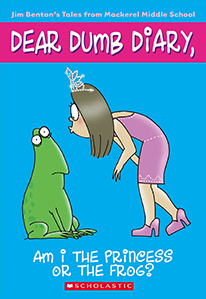 Dear Dumb Diary - Book 3 - Am I The Princess Or The Frog? Home > Dear Dumb Diary > Dear Dumb Diary - Book 3 - Am I The Princess Or The Frog? she blooms in any weather. But I must love her from afar. Can you believe the pain he's in? His suffering? The crushing heartache he endures every time he sees me? Gosh, it just makes me so happy!